If you haven't already heard of YYC Growers, then it is time to get out from under that rock and get to market!! This co-operative of 19 farms works together to bring you fresh, local, tasty produce and other high-quality food products. 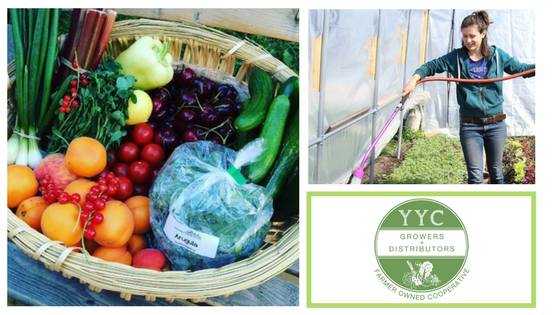 Although they started with us as the individual farm members of Country Thyme Farm and Eagle Creek, they have been with us as YYC Growers for a year now and are a keystone vendor here at the HSCA. YYC Growers is an incredible display of how working together can accelerate a whole community. Stop by the market and say "Hi" to Laura-Leigh, their markets manager (and so much more!!). A: We are a cooperative of urban, rural and micro farms. We started when a handful of urban farmers realized that they kept showing up at all the same markets and that they could all benefit from coming together and sharing the market space instead. We brought the rural farms on board a few years later to expand our offerings and leverage the strength of a rural-urban partnership. Our customers benefit too! By creating a stable sales outlet for our farms, we are all able to focus on what we do best – farming! A: We want to get to know our customer and want our customers to get to know us. We want that direct connection so we can offer 100% transparency and give our customers the chance to “shake hands” with the farmers. A: There is nothing more important in a globalized economy than to support those contributing to the local economy. Not only does it create more jobs and prosperity in our own communities, but it also reduces our ability to “externalize” the aspect of production. As such, we are more likely to make choices that support the health of our community and that of the planet. A: I personally love the sense of community that this market has. All of the vendors look out for each other, to the extent that we become each other’s customers when things get slow! It’s an incredible group of people!! A: We are excited to have launched our 2018 Harvest Box sales – anyone is welcome to sign-up for our Spring or Summer program for fresh local veggies and fun additions like cheese and granola. Find them online, on Facebook, Instagram and at our market every Wednesday!